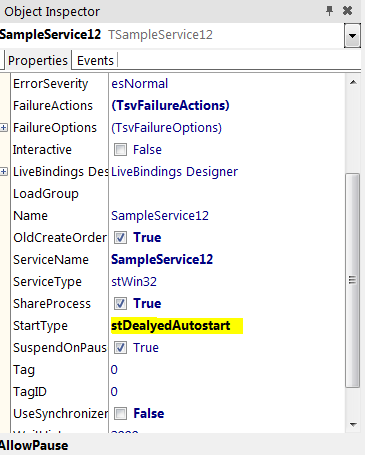 It is a very simple example that shows service delayed autostart feature. Service application with delayed autostart does not start immediately when Windows starts. Instead of it Windows waits for some time before starting the service. It allows to improve OS performance on startup. If your service application does not need immediate start you can use delayed autostart feature. Change the StartType of the service module, erbuild and re-install it. Use links below to download source code of this example as well as example binary. Please note that corresponding version of Delphi should be installed to run this example.